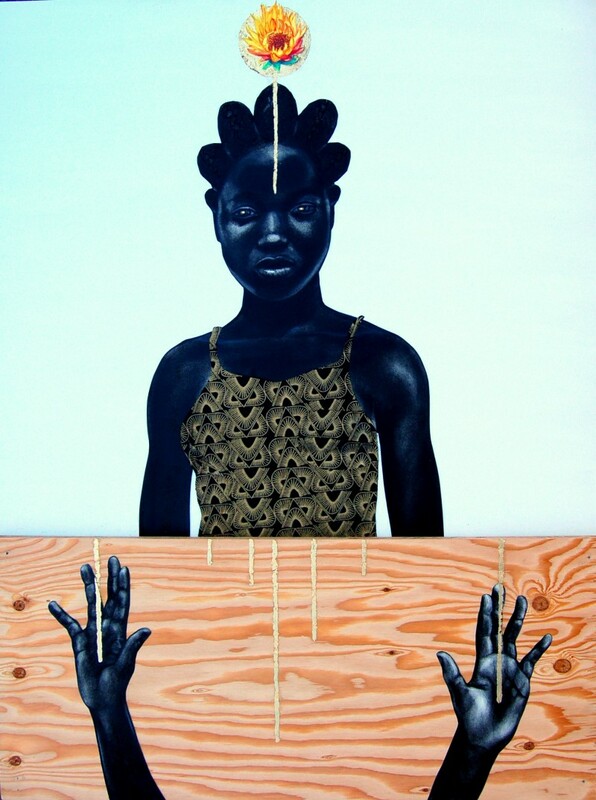 Home › Articles › Culture › San Francisco Art Exhibit "The Black Woman is God" turns the historic devaluation of Black women on its head. San Francisco Art Exhibit “The Black Woman is God” turns the historic devaluation of Black women on its head. This moment is fraught. Racial strife overwhelms the heart. In this moment, bearing witness to transformative art is a way to open our minds, strengthen our souls, and move us forward toward racial justice. One San Francisco art exhibit is accomplishing exactly that. 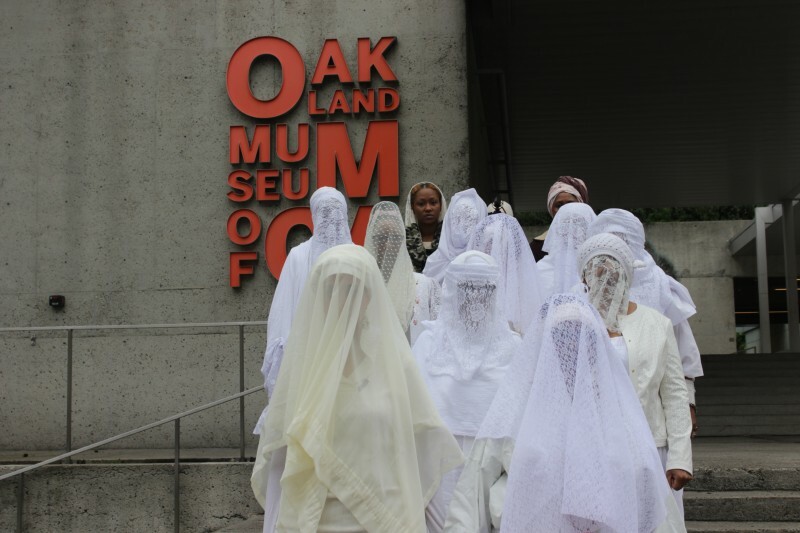 On Thursday, July 7, The Black Woman is God: Reprogramming That God Code launched at SOMArts in downtown San Francisco, and it will be on display through August 17. The installation features more than 60 Black women artists’ depictions of Black women as deities. 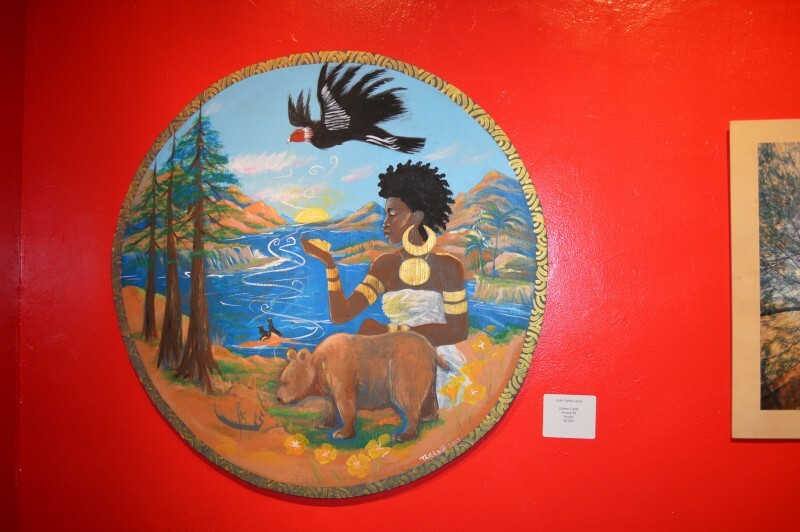 The July 7 kickoff included artists, dancers, and musicians performing inside the spacious SOMArts gallery to celebrate the exhibit and its assertion, The Black Woman is God. At the launch, San Francisco and Oakland-based curators Melorra Green and Karen Seneferu discussed the recent rash of police violence in Black communities in their opening remarks and noted that through coming together, we can move humanity forward. The exhibit intentionally turns the historic devaluation of Black women and their contributions—social, political, economical—on its head. This exhibit asserts Black women’s power and beauty and does not seek to devalue any other group in the process. I write primarily about women’s economic status and the exclusion of women of color from basic labor laws, and the concept of The Black Woman is God is deeply relevant. It applies pressure to the beliefs and values undergirding the laws and policies that exclude Black women’s lives from economic policymaking and their labor from economic value and protection. In particular, domestic work—caring for children, elders, and homes—has historically been rendered invisible in U.S. law and excluded from basic legal protections. The United States’s earliest laws designed to protect laborers, such as the Fair Labor Standards Act (FLSA), which codified the minimum wage, and the National Labor Relations Act (NLRA), which protected collective bargaining activity, were both enacted in the 1930s. Both laws excluded domestic work from economic protection. When slavery was legal, many Black women slaves were confined to cleaning and cooking and caring for slave owners’ homes. The devaluation of domestic labor through legal exclusion is indeed a legacy of slavery and a result of sexism: Southern legislators refused to support these 1930s laws unless they did not include domestic workers, who, in the South, were still predominantly Black women. And labor union leadership still does not include enough women of color. A report from the Institute for Policy Studies published in 2015 notes that “[I]n 2014 black women accounted for 12.2 percent of union membership compared to 10.1 percent for white women, 8.9 percent for Latinas, and 11.8 percent for Asian women. However, in no union are the leadership demographics for black women representative of the union’s membership demographics.” Black women comprise the rank and file of unions and yet they are not the leadership face of the unions. Economic policy and labor activism requires that we make Black women’s lives a focus. 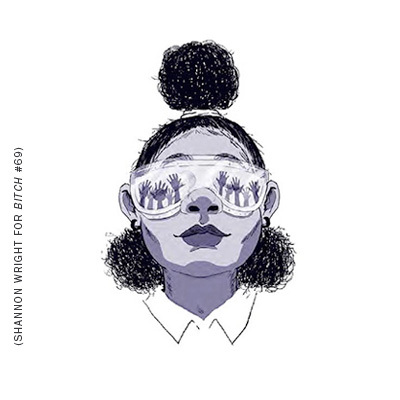 But meaningful economic and social policy changes in these areas also require that the persistent devaluation of Black women in our culture be transformed – which art can help achieve. The power of art helps us envision a new reality and can drive our thinking about what the world can and should look like. 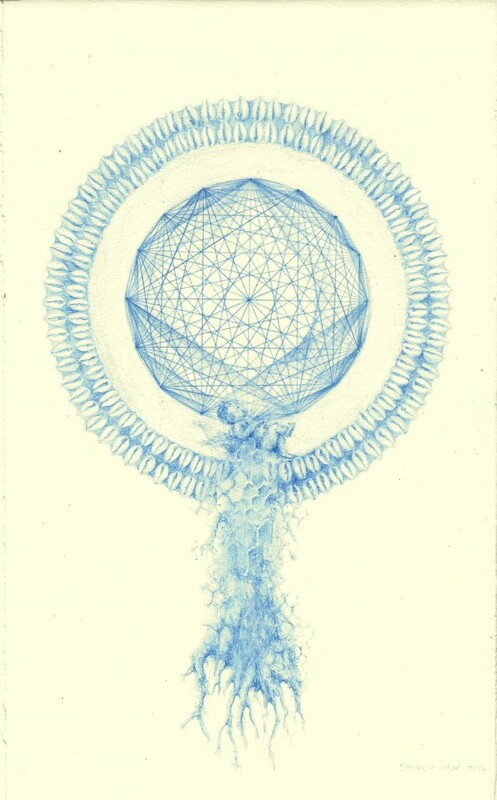 For example, artist Nicole Dixon’s piece Transmission addresses the “need to pass down ancient knowledge from the powerful archetype of the Black woman to the next generation.” Dixon’s mixed-media technique layers drawing, painting, fabric, paper, and natural objects. Indeed, when Seneferu and Green conceived of this exhibit in 2012, Green originally proposed curating only Seneferu’s art. But Seneferu insisted on inviting many, many more women to participate. The result is a truly moving collection with paintings, clay works, photographs, and mixed-media pieces decorating the walls of SOMArts. Together, the women crafted a collective assertion that helps reprogram Black women’s positions in politics and society. Activists fighting for both racial and economic equality are invoking God into their organizing in various ways. For example, Alicia Garza is a cofounder of #BlackLivesMatter and special projects director of the National Domestic Workers Alliance (NDWA), one of the leading organizations fighting for women’s economic equality. Garza’s Twitter handle is Love God Herself. The Black Woman is God exhibit seems to encompass the way in which spirituality already is influencing activism. The installation will be at SOMArts, a gallery in the South of Market (SoMa) region of San Francisco, through August 17. This gallery is led by Maria Jenson, the gallery’s first African-American executive director. The Black Woman is God is emerging as a movement of its own. Green and Seneferu plan to organize The Black Woman is God exhibits nationally to invite more communities to share in the concept. Building The Black Woman is God movement is critical for Black women, their families, and their communities. Sheila Bapat is an attorney and writer focusing on gender and economic justice. Her first book, Part of the Family: Nannies, Housekeepers, Caregivers and the Battle for Domestic Workers Rights was released by Ig Publishing in 2014.